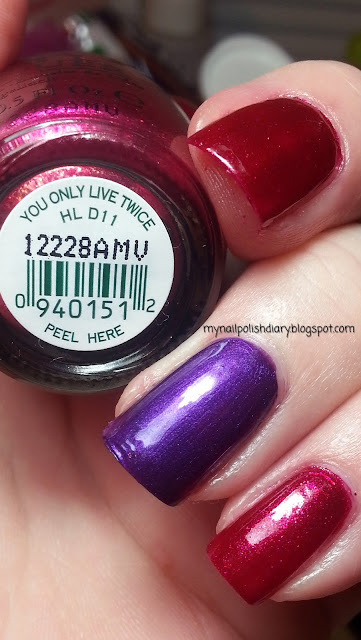 OPI You Only Live Twice is a shimmery magenta. It was released this holiday season in their Skyfall Collection. I like it ok. It didn't blow me away. It's pretty, just not amazing to me. I used OPI Delete Diabetes for the accent and it is as gorgeous as it always is. Even tho I messed that nail up a little :/ Great wear on these two. Lasted several days before I got tip wear. I always have liked red played off purple even after the 'red hat' society got going. It was a color block that worked well in the 80's and works again now that so much color is being shown. I love, love You Only Live Twice - my fav shade out of the Skyfall collection. I never ran into OPI Delete Diabetes before this. I have seen a lung one OPI did and of course they do their breast cancer collections every Oct. I have to look on line to see if I can even find when this Diabetes one came out. It sure slipped under my radar. I have some other purples that are similar however. 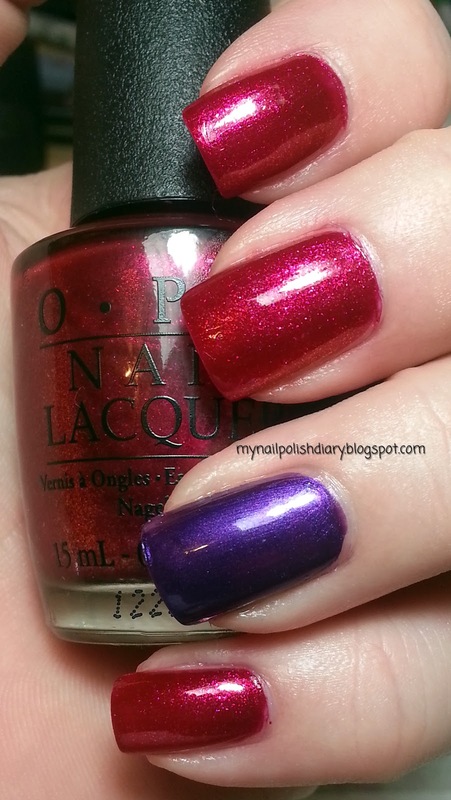 The burple in the Skyfall collection might work (Tomorrow Never Dies I think is the purple one). I have loved this latter one from Skyfall too - it looks stunning with the gold fake Man With a Golden Gun (or Zoya Guilty) over it. Hi beachgal, Delete Diabetes was from the City of Hope Spirit of Life fund raising dinner event recently. As a gift they gave out two exclusive to the dinner, polishes: Delete Diabetes and Spirit of Life. I have both. I need to get Spirit of Life blogged! Thanks for looking! With all the nail hues and clean accessible in the market, which are the ones we ought to embrace this mid year?